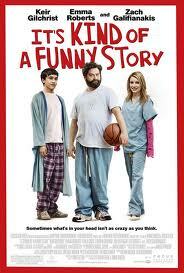 'It's Kind of a Funny Story' is indeed that. With a rather impressive ensemble cast handling complicated emotions this little film certainly has a lot going for it. I haven't seen Keir Gilchrist in anything prior to this film but as our main character Craig I was impressed by his ability to handle the heavy and comedic elements of the script with a natural state of mind. We could see the way he thought and why he thought and felt these very specific ways. This is good as it is kind of the point of the movie and is vital to its plot. Craig is a little depressed, as we all can get-I understand that but I can sometimes have issues and find it hard to feel sorry for people who are unable to handle tough situations and insist on turning to medicine to solve their own mind issues I liked that the script never made Craig a moaner, or someone who was looking for our pity-instead he is just looking for someone to turn to and even a cynic like me "gets this" kind of yearning in a seventeen year old boy who sees everything everyone else has that he doesn't. In feeling this way and creating an interesting atmosphere for the film Craig checks himself into a mental health hospital. Here we encounter many characters and many more plot lines. Gifted director Ryan Fleck handles this well and though I found his focus to sometimes linger a little long on Craig and not on some of the more interesting supporting characters. As genuine as Craig is and as touching as his situation can be it is a fact that it might have been more interesting to see a movie centered around one of his new found friends at the hospital. The obvious choice here would of course be Bob played with charming wit and dark undertones by Zach Galifianakis. As one of the first people Craig befriends, we are immediately wondering why Bob has ended up here, what has happened to him or what he might have done to be placed here. Galifanakis is able to show a diverse angle to his now famously odd persona. The film is only sometimes laugh out loud funny, but has a constant tone that makes you smile. Sadly, Bob mainly works as Craig's counselor, helping him work through the pressures of being a teenager that include talking to girls. Craig is awful at this and we are treated to small segments into Craig's mind as to how he sees his situation and how he would LIKE to see his situations. These offer the film a little indie cred as well as some fantastic moment that include the entire cast, dressed in full Bowie gear performing "Under Pressure". The break out for me here though is that girl Craig eventually has to talk to-Emma Roberts, creating some real credibility for her name after starring in more tween aimed vehicles, playing a teen who has attempted suicide is quite a turn. She plays it well too. She is the one who opens up the conversation-she is a rebel with a good heart, someone not afraid to bluntly express her emotions and unafraid to say she has some issues. She is beautiful and don't know why it takes Craig so long to build his courage up and close the deal on what we all know is coming. While I feel 'It's Kind of a Funny Story' could certainly use have used some more story, such as a better resolution to the Bob character, but it is a tidy and touching story. One we don't have a problem smiling at as we leave the theater.